Let’s keep it sweet and simple. Like these corn cakes! This recipe was practically written for the ingredients in my fridge. CSA this week brought more corn, cherry tomatoes, and lettuce. Add in a handful of potted basil, a green pepper left over from last week, and a ripe avocado, and you’ve got a slam dunk! So. This recipe is really easy. That is, unless you’ve got a very whiny baby trying to pull your pants down because he is on the floor and wants to be up so he can see what you’re doing. Then, in that case, it might seem like it’s taking forever. But I promise…that’s just the baby. Not the meal itself. Shuck your corn and slice off the kernels. CSA has been giving medium-size ears of corn in the last few weeks, while the original recipe called for large ears. I ended up using 5 ears of corn, but you should aim for 2½ cups kernels. Transfer 2 cups of the corn to a food processor and pulse several times. No need to turn it into soup or anything, just process into coarse bits. Mix the processed corn with the remaining whole kernels, finely diced shallot, minced basil, whole wheat flour, cornmeal, baking powder, baking soda, and seasonings. You will end up with a thick, pasty mixture. In a separate bowl, whisk together the eggs, melted butter, and buttermilk. Combine the egg mixture with the corn mixture. Quickly chop up your cherry tomatoes, green pepper, and scallion. Combine in a medium bowl with minced garlic, lime juice, white wine vinegar, olive oil, and more basil. Cut up your avocado. Set it aside; you will add it into the tomato mixture just before serving, so as not to let it get soggy or discolored. Heat a little oil in a large skillet. Using a large cookie scoop, scoop the corn mixture into the hot pan. 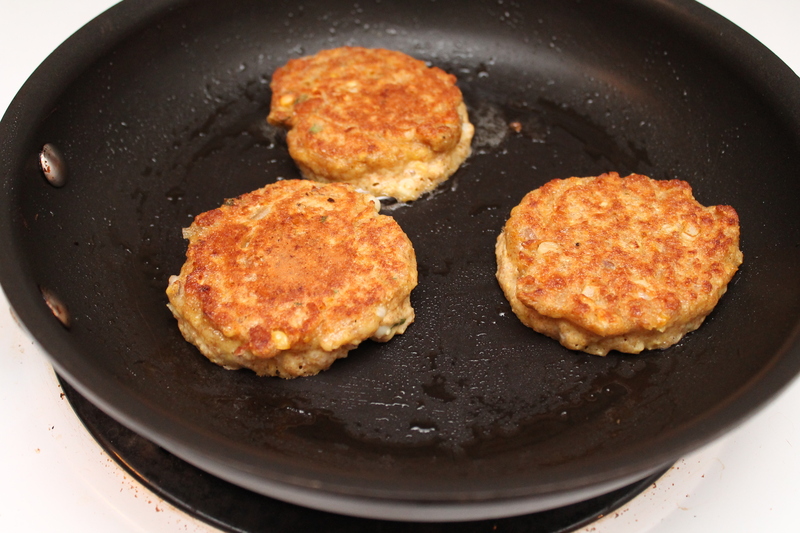 Cook 2–3 minutes on each side, until golden brown. 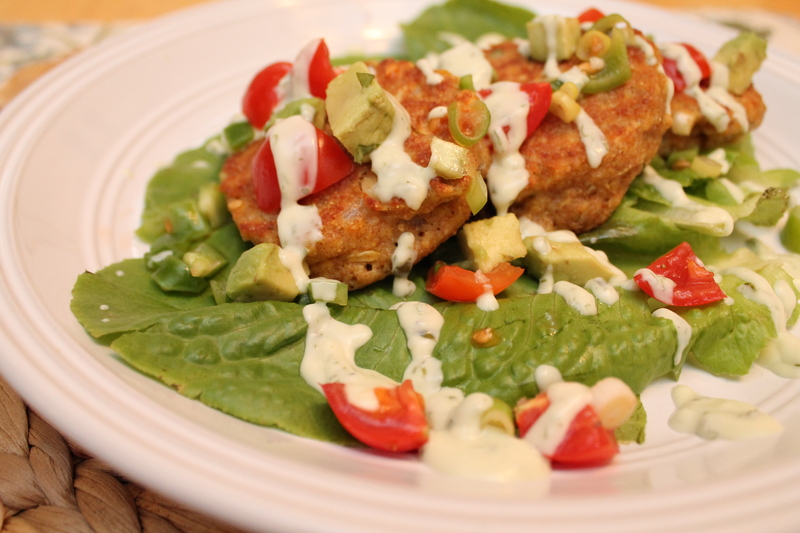 Serve the corn cakes topped with the tomato avocado relish and a drizzle of ranch dressing. Cut the corn kernels off of the cobs and place in a large bowl. Place 2 cups of the corn kernels in the food processor and pulse several times, until the corn is slightly pureed but still chunky. 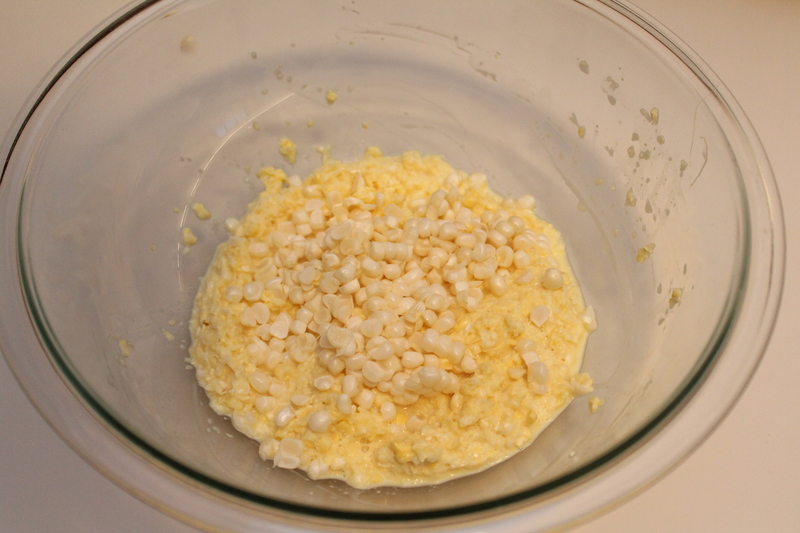 Scrape the pureed corn into a large bowl with the remaining corn kernels. 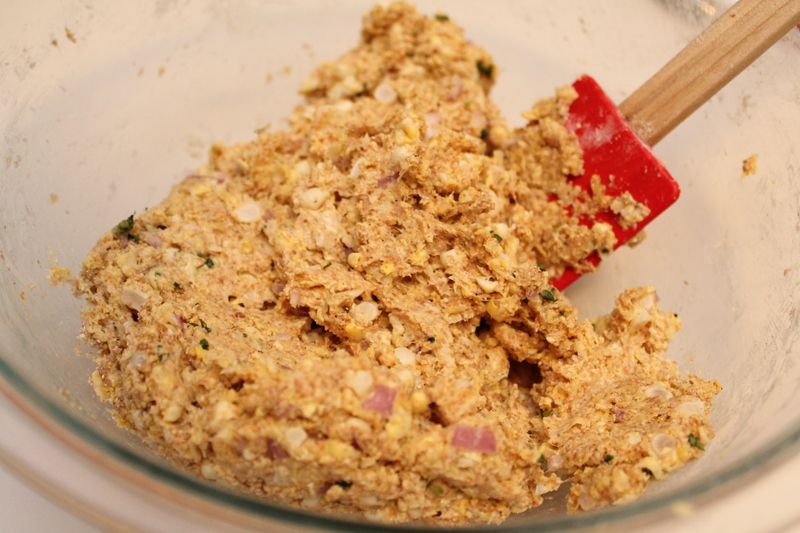 Add the flour, cornmeal, onion, basil, baking powder, and baking soda to the bowl. Season lightly with salt and pepper. Stir to mix well. Add the eggs, buttermilk, and butter, and stir the mixture just to combine. 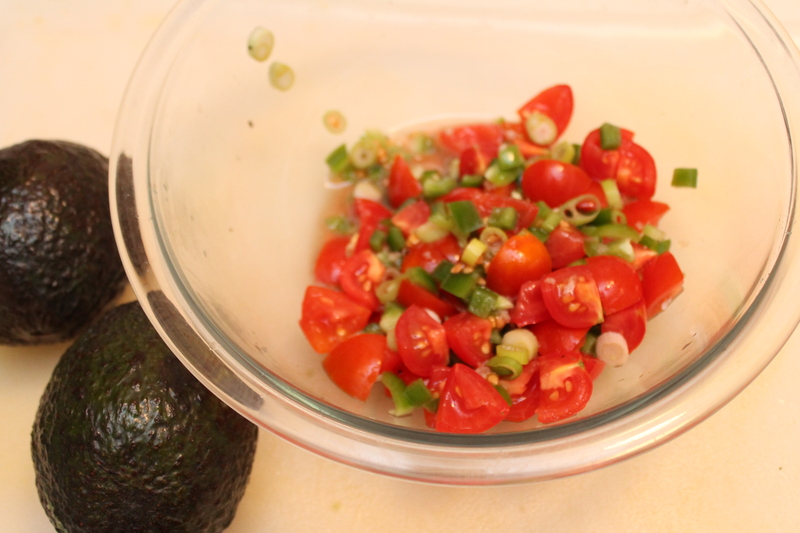 To make the salsa, combine all of the ingredients except the avocado in a medium bowl and mix well to combine. Just before serving, mix in the avocado. Place a large skillet over medium heat. Add just enough oil to barely cover the bottom of the pan and heat until sizzling hot. Scoop the batter into the skillet about 1½ tbsp. at a time, cooking the cakes in batches of 3–4 so that they are not touching. Fry about 2 minutes per side, until golden brown. Transfer the cooked cakes to a wire rack and repeat with the remaining batter. 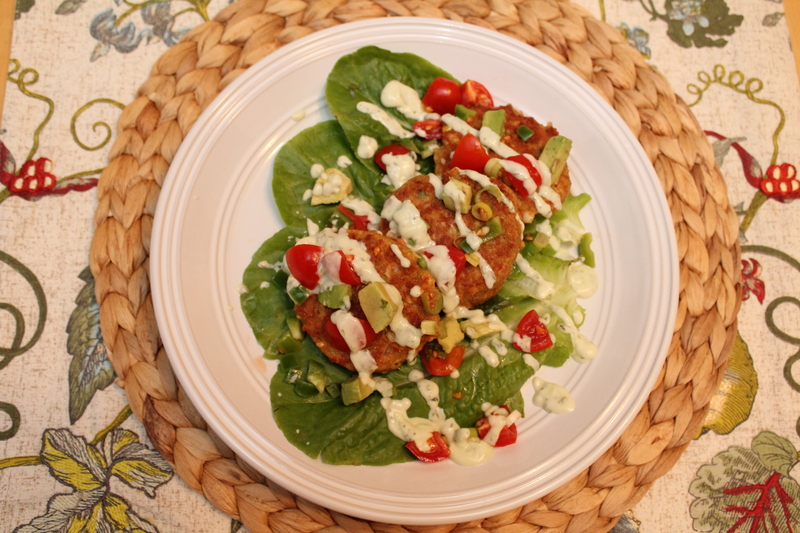 Serve immediately topped with the relish and drizzled with ranch dressing, if desired.